Dictyonema retiforme has been regarded as the benthic ancestor to the planktic Graptoloidea, represented by the earliest planktic Rhabdinopora flabelliformis and its descendants. The revision of the type material of Dictyonema retiforme, the type species of the genus Dictyonema, from the Silurian of New York State shows compound stipes formed by the complexly growing and overlapping tubular thecae of acanthograptid type. The connections between adjacent stipes are formed by thecal tubes or thecal bridges and not by dissepiments. Thus, the species has to be transferred to the Acanthograptidae and cannot be regarded as being related to the early planktic Graptoloidea. The tubarium meshwork of Dictyonema is phylogenetically unrelated to the meshwork of the planktic Rhabdinopora, and represents a case of convergent evolution. The origins of the planktic graptoloids lie among members of middle to upper Cambrian Dendrograpidae, as can be seen from the thecal style and the triad budding patterns with regularly developed bithecae in this group. The genus Dictyonema Hall, 1851 has long been regarded as the key to the evolution of the planktic graptolites (e.g. Bulman 1927, 1970; Erdtmann 1982; Mitchell et al. 2013; Maletz 2014). Erdtmann (1982, p. 121) in particular, discussed the evolutionary relationships when he differentiated the planktic Rhabdinopora Eichwald, 1855 from ‘its very similar sessile dictyonemid ancestors’ and re‐established Rhabdinopora for the planktic taxa. He also suggested an ‘interregnum’ in which only the fully planktic Radiograptus Bulman, 1950 existed. The genus Rhabdinopora and especially Rhabdinopora flabelliformis with its various subspecies is currently regarded as the earliest planktic graptolite from which an extensive radiation started close to the base of the Ordovician System (Sadler et al. 2011; Cooper et al. 2014) and, thus, is intimately connected to the start of the Great Ordovician Biodiversification Event, or GOBE (cf. Servais & Harper 2018). Numerous taxa have been included in the genus Dictyonema, largely based on the characteristic mesh‐work of stipes with dissepiments recognizable even in completely flattened specimens. Erdtmann (1982) mentioned 232 species, all with a cone‐ to fan‐shaped tubarium and the supposed simple ‘dendroid’ bithecate thecae, of which approximately 140 species were considered benthic and the rest (c. 80 species) planktic. Most of these species are known only from flattened, fragmentary material and details of their thecal development is not available. The thecal development of Dictyonema cavernosum Wiman, 1896 and Rhabdinopora flabelliformis (Eichwald, 1855) among others have been taken as the standard development of Dictyonema (e.g. Wiman 1896; Bulman 1927, 1933; and others) even though both taxa are now included in different genera. The thecal style of Rhabdinopora has been described from numerous specimens preserved in relief in shale and limestone, as well as from chemically isolated material (e.g. Bulman 1925, 1927, 1933; Legrand 1974). It bears a typical triad budding system with aperturally widening metathecal apertures and short, parallel‐sided bithecae, typical of the Anisograptidae. The development of the bithecae is quite variable in their style and curvature in the various taxa attributed to the genus Dictyonema, but less so in Rhabdinopora (see Bulman 1970). 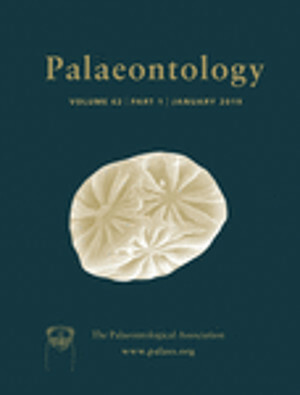 Maletz (2017, p. 133) termed upper Cambrian dendroid remains ‘elusive’ and indicated that the possible ancestral taxa to the planktic Rhabdinopora have never been properly described. Erdtmann (1982) indicated that it is virtually impossible to differentiate the benthic and planktic taxa easily and regarded the nematophorous sicula as the main differentiation feature of the two groups, following Kozłowski (1971). Legrand (1983, 1985), however, considered the differentiation of Rhabdinopora and Dictyonema to be premature, as the type species of Dictyonema, Gorgonia? retiformis Hall, 1843 remained unstudied and unrevised. A recent investigation of the holotype and additional specimens of Dictyonema retiforme (Hall, 1843) revealed the presence of tubular thecae on compound stipes and the lack of true dissepiments, indicating a relationship to the Acanthograptidae, but not the Dendrograptidae. The type material is here re‐described and interpreted. It clearly shows that the species is not closely related to Rhabdinopora flabelliformis, and thus an evolutionary relationship with Dictyonema retiforme as an ancestral taxon to the planktic Rhabdinopora flabelliformis has to be considered unlikely. AMNH, American Museum of Natural History, New York, USA; NYSM, New York State Museum, Albany, NY, USA; NIGP, Nanjing Institute of Geology & Palaeontology, Nanjing, China; IRScNB, Royal Belgian Institute of Natural Sciences collections, Brussels, Belgium; CGF, Centre Grégoire Fournier, L'abbaye de Maredsous, Denée, Belgium; LO, Geology Department at Lund University. The taxonomy of the Graptolithina is based on Maletz (2014) and will not be discussed herein. The genus Dictyonema is transferred from the Dendrograptidae to the Acanthograptidae based on the thecal development. The term thecal bridge is here introduced for lateral stipe connections in graptolites formed from thecal tubes. Thecal bridge: Development of lateral connections between adjacent stipes through thecal tubes, while stipes retain their consistent lateral distance. Thecal bridges can be formed from a single thecal tube or be complex and include more than one tube. A thecal bridge should not be confused with anastomosis, which is defined by temporary lateral fusion of stipes with or without thecal transfer (Maletz et al. 2014). Thecal bridges are formed without temporary lateral fusion of the stipes. The thecae forming the thecal bridge cross over from one stipe to an adjacent one, while both stipes keep a constant lateral distance. Maletz & Gonzalez (2017) used the term bridge for lateral connections of branches in Cephalodiscus dodecalophus M'Intosh, 1887 tubaria. It is unclear whether the thecal bridges are formed by autothecae or bithecae in the Acanthograptidae. Benthic graptoloids with variable shape of colonies, from erect, bushy, cone‐ or fan‐shape; complex stipe development of tubular thecae form ropy appearance; anastomosis, or thecal bridges present in some taxa; thecae elongated, tubular, with isolated autothecal apertures; isolated thecal apertures oriented ventrally or laterally; development of twigs common; regularly placed bithecae based on a triad budding concept may be present, but size differentiation of bithecae is not universally present; sicular and proximal development unknown. Chapman et al. (1993) described the Pseudodictyonemidae for Silurian to Carboniferous taxa of the genera Pseudodictyonema Bouček, 1957 and Ptiograptus Ruedemann, 1908. The taxa were supposed to have a fan‐shaped tubarium with compound stipes, showing anastomosis and dissepiments. As the genus Pseudodictyonema is a synonym of Dictyonema, the family Pseudodictyonemidae Chapman et al., 1993 becomes a synonym of the Acanthograptidae. The presence of dissepiments is uncertain in the Acanthograptidae, as the type material of Dictyonema retiforme shows the presence of thecal bridges and these may be present in other species referred to the genus Dictyonema. Thecal bridges also form the lateral connections in Dictyonema fournieri (Ubaghs, 1941), a species that was previously referred to the genus Ptiograptus, and were found by the author in the type material of Ptiograptus percorrugatus Ruedemann, 1908 during a recent revision. Gorgonia? retiformis Hall, 1843, p. 115; subsequent designation Miller, 1889, p. 185. Tubarium conical to fan‐shaped; conical tubaria varying from almost cylindrical to almost discoidal; stipes straight, subparallel to parallel, branching dichotomously; stipes united by regularly or irregularly produced thecal bridges formed from single or multiple thecal tubes; stipes compound, formed from complexly overlapping slender, tubular thecae; thecal apertures isolate, openings oriented ventrally; sicular and proximal development unknown. As Hall (1851) referred two species to the genus Dictyonema, Miller (1889) selected Dictyonema retiforme (!) as the type species. The type material of Dictyonema retiforme is flattened, but still shows some details of the tubarium construction. The stipes show a ropy appearance in the flattened material (Fig. 1B, C), indicating elongated, tubular thecae form the stipes. The connections between the stipes are formed by thecal bridges, either through individual thecae or groups of thecae, as illustrated by Hall (1852, pl. 40F) (Fig. 1B). Hall (1852, p. 174) even mentioned that the ‘surfaces of branches [are] indented, or intermittingly striated in an oblique direction’, his way of describing the ropy appearance of the compound stipes. Figure 1 Open in figure viewerPowerPoint Original illustrations of Dictyonema retiforme. A, AMNH‐FI 30945, holotype (from Hall 1865, fig. 10). B, detail of holotype, (scale not provided in original publication; from Hall 1852, pl. 40F). C, NYSM I 7112, detail of specimen showing compound stipes and crossing tubular thecae forming thecal bridges (from Ruedemann 1908, fig. 64). Scale bars represent 10 mm (A); 1 mm (C). Hall (1851) initially identified Dictyonema as a genus of corals and only later recognized it as a genus of graptolites (Hall 1865). The proximal end of this cone‐shaped tubarium is unknown as the centre of the type material is missing and other available specimens are incompletely preserved. There is also no information on the development of the thecal apertures in his material. Based on Dictyonema retiforme, the genus Dictyonema is here regarded as a taxon of the family Acanthograptidae due to the presence of compound stipes with tubular thecae. There is no evidence of the presence of bithecae, but this may be due to the preservation largely as flattened films of organic material. The genus Pseudodictyonema Bouček, 1957 with its type species Dictyonema graptolithorum Počta, 1894 is a synonym of Dictyonema. Bouček (1957) described the thecae as tubular, of acanthograptid shape with the dissepiments of the species apparently formed from ‘bithecae’. He illustrated relief fragments of D. dilatatum (Bouček, 1957) and D. graptolithorum (Počta, 1894) showing the tubular thecae on the compound stipes. Bulman (1970) indicated a ropy appearance of the stipes due to the elongate, complex growth of the thecae. Bouček (1957) transferred a number of species from the Wenlock to Pridoli (Upper Silurian) of the Czech Republic to the genus. Chapman et al. (1993, 1996) extended the biostratigraphical range of the ‘pseudodictyonemids’ to include the Silurian to Carboniferous time interval. The identification of a ropy, acanthograptid thecal style with thecal bridges forming the connection between the stipes in the type species of Dictyonema provides a considerable problem for the identification of earlier ‘Dictyonema’ species. All taxa with a simple dendroid thecal style and dissepiments, identical in construction to those of the genus Rhabdinopora, have to be included in another genus eventually. The genus Dictyonema is widely distributed in the Silurian to Carboniferous and may be found worldwide. A revision of many Cambrian to Carboniferous ‘dictyonemid’ species may be needed before the exact biostratigraphical range of the genus can be established, as they are usually identified only by a meshwork of stipes with lateral connections or thecal bridges, previously identified as dissepiments. Gorgonia? reteformis Hall, p. 115, fig. 1. Dictyonema retiformis (Hall); Hall, p. 401 (no illustration). Dictyonema retiformis Hall, p. 174, pl. 40F, fig. 1a‐1b. Dictyonema retiformis Hall; Hall, pl. 7, fig. 1. Dictyonema retiformis (Hall); Hall, p. 12, text‐fig. 10. Dictyonema retiformis (Hall); Nicholson, fig. 69. Dictyonema retiformis (Hall); Nicholson, fig. 26. Dictyonema retiforme (Hall); Spencer, p. 23, pl. 3, figs 1‐2. Dictyonema retiforme (Hall); Miller, p. 185, fig. 168. Dictyonema retiforme (Hall); Ruedemann, p. 155, pl. 3, fig. 1, text‐fig. 64. Dictyonema retiforme (Hall); Bassler, p. 18, text‐figs 19‐20. Dictyonema retiforme (Hall); Ruedemann, p. 185, pl. 7, fig. 14. Dictyonema retiforme (Hall); Erdtmann, p. 124, pl. 1, fig. 1. Whitfield (1899, p. 78) listed AMNH 1671 as the type specimen. The specimen now bears the number AMNH‐FI 30945 and should be referred to as the holotype as it was the only specimen of this taxon originally illustrated by Hall (1843) and can be easily recognized from the fairly accurate drawing in Hall (1865) (Fig. 1A, B). The specimen has been re‐illustrated several times (Hall 1852, 1861, 1865; Nicholson 1872a, b; and others) in drawings of varying quality, but has never been investigated in more detail. Hall (1852) illustrated two specimens, including a larger one, now identified as AMNH‐FI 30943. The type locality is the Rochester Shale at Lockport, New York. When he differentiated the planktic taxa, as Rhabdinopora, from the benthic Dictyonema, Erdtmann (1982) erroneously selected as lectotype specimen NYSM I 7112 (Fig. 2C) from the Rochester Shale of Lockport, NY (illustrated by Ruedemann (1908, pl. 3, fig. 1; text fig. 6) and Ruedemann (1947, pl. 7, fig. 14)) and provided a photograph of the specimen. Large, cone‐shaped Dictyonema with robust stipes and wide meshes; complexly developed acanthograptid thecal tubes in the stipes visible in dorsal view; thecal apertures only visible in ventral or lateral views; presence of bithecae and stolon system not determinable. This description is based largely on the holotype and a second specimen (AMNH‐FI 30943), illustrated by Hall (1852). The second specimen is here not identified as belonging to the type material, as Hall (1843) originally illustrated a single specimen. The dimension of the holotype is about 40 × 50 mm (Fig. 2B), indicating a cone‐shaped tubarium, in which the proximal end or holdfast is not preserved. The specimen, thus, may have been ripped from its original position on the sea floor and was transported. The second specimen is much larger, measuring about 120 × 130 mm (Fig. 2A) and shows a similar wide open cone‐shape. Also, in this specimen the supposed point of attachment is not preserved. Both specimens show an identical state of preservation. The stipes are largely flattened to a thin film of organic material and fusellar construction has not been recognized. In some parts, the tubaria are found to preserve partial relief and show indications of the complex construction of the stipes from tubular thecae, but a detailed analysis of the thecal tubes is not possible with this material. A lateral view of the stipes in which thecal apertures are visible, has not been detected in the two specimens. Figure 2 Open in figure viewerPowerPoint Photographs of the type material of Dictyonema retiforme (cf. Fig. 1). A, AMNH‐FI 30943. B, NYSM I 7112. C, AMNH‐FI‐30945, holotype. All scale bars represent 10 mm. Colour online. The stipes are 0.6–0.9 mm wide, rarely wider in mature parts of the colonies. The distances between the stipes are about 1.0 mm, probably slightly wider in distal parts of the colonies and more densely spaced in proximal regions. There are 6–8 stipes in 10 mm. A considerable variation in measurements can be attributed to preservational aspects. The meshes are generally between 2.0 and 5.0 mm long, but the variation is quite large and increased by the possible lack of preservation of many thecal bridges. These may have flaked out due to the splitting of the rock and the resulting incomplete preservation of the organic film of the specimens. The distances between branching divisions are difficult to recognize in the holotype, and few branching divisions have been observed in this specimen. The larger specimen shows branching divisions between 10 and 15 mm long in the central part of the colony and longer distally. The stipes maintain quite regular and consistent distances through the development of the thecal bridges. Some details of the tubarium construction can be seen in higher magnification (Fig. 3). Depending on the light source and direction, low relief parts of the holotype (Fig. 3A–C) show indications of the complexly developed stipes, already correctly described by Hall (1852) and Ruedemann (1908) (Fig. 1B, C). The individual thecal tubes can be estimated at 0.2 mm wide, forming a ropy appearance, but the length of the thecae was not determined. Figure 3 Open in figure viewerPowerPoint Dictyonema retiforme. A–C, AMNH‐FI 30945, holotype; white arrows show complex tubular thecae, grey arrows indicate branching. D–F, AMNH‐FI 30943, second specimen illustrated by Hall (1852); white arrows show tubular thecal bridges, grey arrows show complex thecal growth on stipe and branching based on laterally growing tubular thecae. All scale bars represent 5 mm. The stipes are laterally connected by thin bands of organic material, sometimes showing enough relief to recognize them as thecal tubes (Fig. 3F). They are here identified as thecal bridges connecting the stipes and are, thus, formed differently to the dissepiments of the genus Rhabdinopora and related taxa. Most commonly a single thecal tube forms the thecal bridge, but wider and more complex thecal bridges are not uncommon. The thecal bridges are about 0.2 mm to 0.4 mm wide, depending on the number of involved thecal tubes. The thecal tubes often grow obliquely across the gap to the adjacent stipe and may be curved or straight. Ruedemann (1908) even illustrated thecal bridges crossing each other (Fig. 1C). There is no evidence in Dictyonema retiforme of the presence of true dissepiments connecting adjacent stipes. Branching is common in the tubaria, but details are not available on the number of thecae involved. Usually, the stipes maintain their width when branching (Fig. 3A), but there are also cases in which the stipes are more slender after the branching division and get wider after a short distance. Due to the preservation, it is not always clear whether branching occurs or the feature has to be regarded as anastomosis (Fig. 3A, arrow b). A wide, distally curved thecal bridge may connect the two adjacent stipes directly below the branching division of the left stipe in this case. The division may alternately be interpreted as the junction of two thecal bridges forming a new stipe instead. The second specimen illustrated by Hall (1852) shows slightly more relief and supports the identification of the compound stipes (Fig. 3D–F). Due to the preservation, the stipes look more irregular, but this is caused by flaking out of some of the fusellum and covering of other parts by sediment. Nicely preserved tubes cross from stipe to stipe to form the thecal bridges. Also, in this specimen the branching divisions are clearly seen (Fig. 3E, arrows) and may be interpreted in different ways due to associated wide thecal bridges. Hall (1843) initially identified the species as ‘reteformis’, but invariably in later publications spelled the name as ‘retiformis’, which became the accepted species name for Dictyonema retiforme. Ruedemann (1908) described Dictyonema retiforme as reaching a diameter of at least 0.5 m and having branches and meshwork ‘coarse in proportion’. The stipes are 0.6–0.8 mm wide, but may reach 1.0 mm. The ‘dissepiments’ are 0.2–0.3 mm wide, rarely up to 0.4 mm. The ‘dissepiments’ are perpendicular to oblique, sometimes crossing each other, but rarely less than 0.5 mm apart. ‘Gurley remarks that “Hall's enlargements [1852, pl. 40F] are taken from an entirely different species (either D. expansum or C. subretiforme),” but since in the earlier time all enlargements were free‐hand drawings and often more diagrammatic than accurate, we believe that these enlargements are actually taken from D. retiforme, and add here a camera enlargement of our own to give a more correct conception of the details of this species’ (Ruedemann 1908, p. 157; probably referring to an unpublished manuscript by Gurley, see Bassler 1909, p. 18). This description nicely characterizes the species and is generally correct. Therefore, it is surprising, that Bouček (1957) did not realize, that the species would fit in his subgenus Dictyonema (Pseudodictyonema), elevated to genus rank by Chapman et al. (1993). Dictyonema retiforme (Hall, 1843) has never been described in detail since its introduction and we still have only the original illustration and description to judge this taxon from. The diagnosis was based on the dichotomously branching stipes with regular or irregular connections identified as dissepiments. Hall (1843) initially suggested that the species should be included in the genus Gorgonia with hesitation, but later Hall (1851) created the new genus Dictyonema for the taxon and called it Dictyonema retiformis. Ruedemann (1947) listed the species from the Rochester Shale of New York State, the Lockport Limestone at Hamilton, Ontario (Canada), the Lower Rochester and Thorold fauna of Ontario and in the Gasport Lens of the Lockport Formation. Brett et al. (1995, p. 41) identified the age of the Rochester Shale as middle Sheinwoodian (Parechmina spinosa ostracod zone or Kockelella ranuliformis and Ozarkodina sagitta conodont zones), early to middle Wenlock, Silurian. Bassler (1909) and Ruedemann (1947) mentioned that the species appears to be rare and that it has been impossible to find any specimens showing the thecae. Počta (1894) compared the species with the Bohemian taxon Dictyonema giganteum Bouček, 1957 (identified by Počta as Dictyonema grande Barrande, 1850). It is also similar to the large and robust Dictyonema crassibasale Bassler, 1909, associated with Dictyonema retiforme in New York State (see Ruedemann 1925). Nothing is known on the possible wider distribution of the species. The evolution of the benthic Dendrograptidae into the early planktic Anisograptidae and especially the earliest planktic taxon Rhabdinopora flabelliformis has been regarded as an established fact for quite some time (cf. Erdtmann 1982). As planktic graptoloids appear first close to the base of the Ordovician System (see Cooper et al. 1998, 2001), this appeared to be the most crucial point in the evolution of the graptolites and most investigations on graptolite evolution and diversity only start here (e.g. Sadler et al. 2011; Cooper et al. 2014). After the detailed description of Rhabdinopora flabelliformis from chemically isolated material (Bulman 1925, 1927), this ‘early Dictyonema’ was considered to be the key to the evolution of planktic graptolites and to represent the typical construction of the thecae of Dictyonema. This fact is even more obvious as the Tremadocian time interval was included in the Cambrian System at the time and Bulman (1927) and Ruedemann (1947) described their material of ‘Dictyonema’ flabelliformis and its subspecies under the heading ‘Cambrian’. Dendroids with a comparable tubarium and thecal construction were described under a number of names from the Ordovician and Silurian of Baltica (e.g. Holm 1890; Wiman 1896; Bulman 1933; Urbanek & Mierzejewski 2009), all possessing a fairly simple anisograptid thecal style with a triad budding system and conspicuous bithecae of variable shape (Maletz et al. 2017). The main problem is the lack of data from the upper Cambrian, the interval called the ‘Furongian Gap’ by Servais & Harper (2018), and the ensuing diversification of the Graptolithina during the GOBE interval (Sadler et al. 2011). Few graptolites have been described from this interval that provide enough information on the tubarium construction for an attempt to interpret the origin and early evolution of planktic graptolites. However, the number of taxa described from the Furongian interval is considerable (cf. Rickards & Durman 2006), but needs revision, as many taxa are described from poor fragments and information on thecal details is not available. Also, the precision of the biostratigraphical occurrence and range of most taxa is quite low. The general tubarium shape of the dendroid graptolites may easily be misleading. The presence of a meshwork of stipes with perpendicular connections, previously termed dissepiments, can be formed in different ways. Urbanek & Mierzejewski (2009) investigated the dissepiments of Ordovician benthic ‘Dictyonema’ sp. and ‘Dictyonema’ sp. cf. ‘D.’ cervicorne. The dissepiments were formed as connections between stipes constructed from fusellar and cortical material and appear to be formed by two adjacent bithecal zooids connecting the dissepimental rod in the middle. There was no thecal growth across the gap. A similar development was previously shown by Bulman (1927) for Rhabdinopora flabelliformis (Fig. 4F), where the base of the dissepiment was seen at the aperture of the bitheca on one side, but not on the other. The dorsal side of the stipes shows the lateral origin and curved growth of the autothecae (Fig. 4G), while the ventral side provides the apertural view (Fig. 4F). In the lateral view of the stipes, the shape of the autothecae shows the distinct widening towards the aperture and the presence of a short rutellum (Fig. 4E). Figure 4 Open in figure viewerPowerPoint Stipe construction in Acanthograptidae and Dendrograptidae. A–C, Dictyonema fournieri (Ubaghs, 1941), Devonian, Belgium; A–B, IRScNB a7671; A, laterally preserved thecal apertures; B, detail in dorsal view as latex cast with compound stipes and irregular growth of thecal tubes; C, CGF 702, holotype, part of tubarium showing general pattern of stipes and thecal bridges. D, G, Rhabdinopora parabola (Bulman, 1954), NIGP 164496, NIGP 168421, Dayangcha, Jilin Province, China; flattened proximal end with characteristic nemal threads showing slender dissepiments connecting stipes and fragment showing dorsal side of stipes with patterns of thecal origin. E–F, Rhabdinopora flabelliformis (Eichwald, 1840), stipe fragments in lateral (E) and ventral (F) views, showing thecal development (after Bulman 1933, pl. 1). H, Acanthograptus divergens Skevington, 1963, LO 11412t, Middle Ordovician, Öland, Sweden; chemically isolated specimen showing ventral side with aperturally isolated tubular thecae. Scale bars represent: 1 mm (A–B, E–H); 5 mm (C, D). Colour online. The thecal and stipe development in the Acanthograptidae is quite different and has rarely been observed in detail. Skevington (1963) and Bulman & Rickards (1966) provided information of the thecal development from small stipe fragments. Maletz & Kozłowska (2013) illustrated ?Acanthograptus sinensis Hsü & Ma, 1948 from the Tremadocian of China. This species shows slender, tubular thecae with isolated apertures and complexly overlapping tubes on the stipes, but none of these details would be recognizable in completely flattened material. Bouček (1957) illustrated the complex tubular thecae in pyritized material of a number of species from the Silurian of Bohemia and, recently, dendroids with pritic preservation from Belgium established the presence of this pattern in the Devonian (Fig. 4B). The Belgian material, referred here to Dictyonema fournieri (Ubaghs, 1941), clearly shows the presence of multiple thecal tubes crossing from one stipe to another, forming the characteristic thecal bridges of the genus Dictyonema. None of these details are easily visible in shale material at low magnification (Fig. 4C). Interestingly, the Silurian and Devonian taxa do not show the lateral growth of the isolated metathecal tubes that is so common in the Ordovician and which leads to the development of secondary lateral stipes and twigs in many Acanthograptidae (Wiman 1895: Ptilograptus suecicus). Thus, Dictyonema species are very difficult to differentiate from the much simpler thecal style in Rhabdinopora and related taxa (cf. Fig. 4C, D). The characteristic mesh‐work of the ‘Dictyonema’‐style colony shape must have evolved independently through convergent evolution in both groups as it is constructed from different initial features. In the genus Rhabdinopora and related Dendrograptidae, the development of dissepiments are lateral constructions, possibly formed by bithecal zooids (Bulman 1927; Urbanek & Mierzejewski 2009). In the Acanthograptidae, a similar development is formed from thecal tubes crossing over from one to another stipe. Both the Acanthograptidae and the Dendrograptidae are present in the upper Cambrian. Chapman et al. (1996) suggested that the Acanthograptidae derived from the Dendrograptidae in the late Cambrian and had undergone initial diversification already within this time interval. The Acanthograptidae form a large group of dendroid graptolites in the Ordovician to Carboniferous time interval, but their constructional changes are difficult to follow. The stipes show a clear differentiation of the dorsal and ventral side. All thecal apertures are directed to the ventral side or laterally (Fig. 4H), while in dorsal view no thecal apertures can be seen. Thus, a serial orientation is present in this group, as it is in the planktic Rhabdinopora and its benthic relatives, the Dendrograptidae. The thecal style does not change with time, but the exact pattern of thecal differentiation is unclear, as is the presence of diad or triad budding in most taxa. Bulman (1970) indicated a triad budding system in the Acanthograptidae. The triad budding is largely established in the Acanthograptidae through serial sections (e.g. Bulman & Rickards 1966) and the details of the stolon system have not been described for this group. Saunders et al. (2009) described the triad budding in some detail for the acanthograptid Desmograptus micronematodes. It does not differ from the development in other dendroid taxa (see Bulman 1970). Dictyonema retiforme from the Sheinwoodian (Wenlock, late Silurian) is a relatively young taxon, originating from a time interval much younger than the evolution of the planktic graptoloids and indicates an extensive evolutionary change during a long time interval. Due to the differences in the tubarium construction, the Dictyonema retiforme group of taxa cannot be closely related to the early planktic Rhabdinopora flabelliformis. The construction of Rhabdinopora flabelliformis instead indicates a close phylogenetic relationship to the genus Dendrograptus and related forms. The genus Dendrograptus does not show any dissepiments, but there are a number of dendroids with dissepiments, previously identified under the genus name Dictyonema, that are probably related. Most Cambrian species referred to the genus Dictyonema by Ruedemann (1947) and Mu et al. (2002) are too poorly preserved to show any thecal details and their relationships remain uncertain. More research is necessary to understand the evolution of the early planktic graptolites. This work is supported by DFG MA 1296/7‐1. Photos of AMNH material was provided by Bushra M. Hussaini (AMNH New York, USA). Lisa Amati (Albany, New York, USA) provided photos of material in her collection (NYSM). Stijn Goolaerts, Bernard Mottequin and Annelise Folie provided access to the Devonian forms from Belgium preserved in the Royal Belgian Institute of Natural Sciences collections in Brussels, Belgium (IRScNB). Bernard Mottequin provided the photo of the holotype of Dictyonema fournieri (Ubaghs). This paper is a contribution to IGCP project 653, ‘The onset of the Great Ordovician Biodiversification Event.’ This paper was improved in the light of helpful comments from two anonymous referees and the technical editor, Sally Thomas.